Among all the pan-hellenic games in Ancient Greece, the most important ones were held in Olympia. “As water is the most precious of all elements, as gold appears as the most expensive of all goods, and finally as the sun shines more than any other star, Olympia shines shading every other game” Pindar sings in his first Olympic ode. According to mythology, Gods first competed in Olympia. 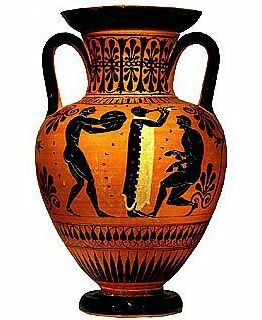 Zeus beat Cronus in wrestling; Apollo beat Hermes in race and Ares in boxing. In addition, the ancient sources cite several heroes as founders of the games. 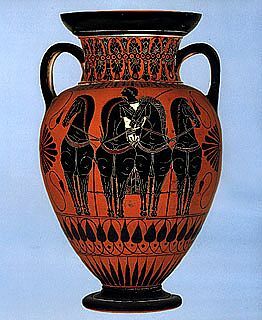 The myth of Pelops is part of the Mycenaean mythology. After his victory over Oenomaos, Pelops founded games to honour Oenomaos in order to be purified and thank the Gods for his victory. Hippodamia founded women’s games in honour of Hera, the so-called Heraea games. That is how the games were established in Olympia. According to other myths, demigod Hercules founded the games introducing the race and the chariot race. Hercules carried the wild olive tree from the land of the Hyperboreans, he planted it in the sanctuary and determined the limits of the sacred Altis. Furthermore, according to other myths, Idaean Hercules with his four brothers, Dactyls or Curetes arrives in Olympia from Crete, defines the length of the stadium, organises races with his brothers and crowns the winner with a wreath of a wild olive-tree. Nileas, Pelias and Pissos, the famous hero of Pissatida are also considered to be among the founders of the games. Finally, Strabo believes that the games were organised by Oxylos the king of Heracleides after their descent to Eleia (after 1200BC). Later they were reorganised by Ifitos who contracted agreement (the sacred truce) with the king and legislator of Sparta Lykourgos and the king of Pissa Cleisthenes. Therefore, Olympia became a pan-hellenic centre. The ancient written sources report as year of beginning of the games the year 776BC. From that year starts the list of Olympic champions and is completed much later. The Pissates organised the games from 668 until 572BC. In 570BC the Eleians occupied Pissa and controlled the organisation of the games. In the 5th century the games reached the peak of their glory. 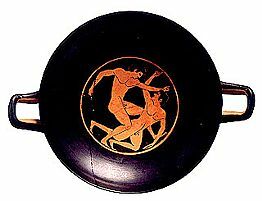 During the Hellenistic era, they lost their initial character and were transformed into professional sport events. That was consolidated during the roman era. The big historical events that took place in Greece had an impact on the sport ideals of the Olympic games. As a result, there has been a gradual decadence of moral values which was worsened remarkably from 146BC, when Greece was conquered by the Roman Empire and the Eleians lost their independence. During the 2nd AD century, when the right of Roman citizenship was granted to all the residents of the Roman Empire, the games became international. Finally, in 339AD, Emperor Theodosius I abolished the Games as taking part in any worshipping of idols was forbidden. The Olympic games forged the national, racial and spiritual unity of Greeks. They combined the deep religious spirit with the heroic past of Greeks, the highest degree of cultivation of the body, mind and soul with the universal philosophical values and the promotion of individuals and cities with the utmost ideal of freedom. The international character of the games survives in modern Olympic games, and after an interruption of 15 centuries, they were revived in Athens in 1896 and take place since then every four years.